Rhinoplasty vs. Septoplasty: What’s the Difference? Rhinoplasty and septoplasty are both nose procedures, but they are not identical. Now, let’s take a look at rhinoplasty, septoplasty and the differences between the two surgeries. A rhinoplasty, also referred to as a nose job or nose surgery, is one of the most common cosmetic procedures. It is used to enhance the proportions of the nose and address nasal asymmetry, resulting in a balanced, natural-looking facial appearance. Improved Facial Symmetry: Rhinoplasty helps a patient achieve a nose that complements his or her cheeks, eyes and other facial features. Correction of Birth Defects and Sinus Issues: Nose surgery is used to repair and eliminate nose deformities and address chronic sinusitis (nasal passage inflammation). Enhanced Breathing: A nose job is sometimes performed to correct breathing issues. Male Rhinoplasty: Helps men improve nose symmetry and correct structural defects of the nose. Teenage Rhinoplasty: Addresses cosmetic and structural issues of the nose; teenage rhinoplasty is generally performed on boys as early as 16 or 17 years old and girls as early as 15 or 16 years old. Ethnic Rhinoplasty: Accounts for the distinct facial features associated with a patient’s ethnic background to produce a nose that naturally complements these features. Dr. Babak Azizzadeh of the CENTER for Advanced Facial Plastic Surgery in Los Angeles understands the intricacies of the nose, and he strives to administer rhinoplasty surgeries to help patients achieve natural-looking and beautiful noses. To accomplish this goal, Dr. Azizzadeh first meets with a patient and performs a full evaluation of this individual’s facial features and medical history. If Dr. Azizzadeh confirms a patient is a good candidate for nose surgery, he then develops a custom treatment plan. This approach ensures Dr. Azizzadeh can produce a nose that perfectly matches a rhinoplasty patient’s face. A septoplasty corrects a deviated septum, i.e. bone and cartilage that divides the nostrils. A deviated septum blocks one side of the nose, reducing airflow and making it difficult to breathe through one or both sides of the nose. Additionally, a deviated septum sometimes causes nasal dryness that leads to crusting or bleeding. During a septoplasty procedure, the doctor straightens and repositions the nasal septum. He or she may trim, reposition or replace nasal cartilage or bone, as well as cut and remove parts of the nasal septum before reinserting them into the correct position. Rhinoplasty vs. Septoplasty: Which Procedure Is Right for You? 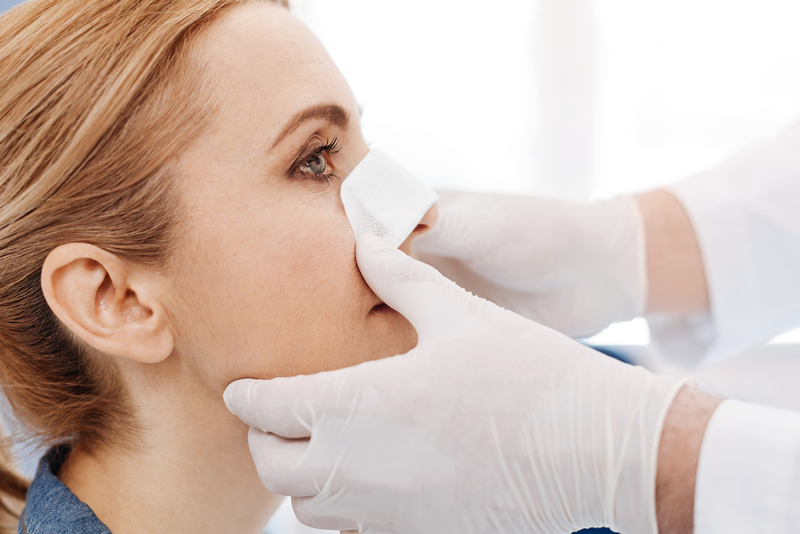 Rhinoplasty and septoplasty are two different surgeries, and determining which procedure can help a patient achieve his or her desired results may be difficult. Fortunately, Dr. Azizzadeh removes the guesswork commonly associated with rhinoplasty and septoplasty procedures. Dr. Azizzadeh is happy to meet with patients to discuss rhinoplasty and other facial plastic and reconstructive surgeries. To find out more, please contact us today at 310-657-2203 to schedule a consultation with Dr. Azizzadeh.